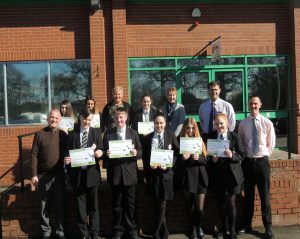 Students from Trinity High School in Redditch are celebrating after successfully completing the Oakland Programme, a structured course designed to provide young people with valuable workplace experience. The Oakland Programme, run by local children’s charity the Oakland Foundation and in partnership with the Oakland Foundation’s key sponsor and local business Oakland International, is an innovative and thought provoking six-month young people’s project, during which time students have the opportunity to experience the workplace and its many environments, with the chance to find out what ‘being at work’ actually involves. Included within the Programme are a number of structured sessions offering future career advice aimed at raising students’ employment aspirations. Foundation Trustee, Mark Williams, commented: “After initially meeting with the school, the Foundation then set about writing the programme to best suit the outcome for the pupils involved. The Oakland Foundation is a charity working with young people and aimed specifically at reducing child poverty within Redditch and Bromsgrove and surrounding area through their work in the areas of Health and Nutrition, Education and Sport.